Explained step by step, here’s the more detailed plan of continuing to use Estadio Anoeta and rebuilding it at the same time. It’s quite a challenge! We already know that Real Sociedad are unwilling to relocate to any other stadium during reconstruction of Anoeta. They may be forced to leave for several games and Athletic Bilbao has already welcomed them to San Mames, just like they had done to Athletic during their construction megaproject. Today we know a lot more about how exactly Real Sociedad want to run their phased redevelopment of Anoeta to maximize the stadium’s use in the meantime. While the club are still waiting for the below schedule to be greenlighted by local authorities, it’s most likely that this is what we’ll see happening in San Sebastian in the next two seasons. Initially it was expected that work might commence in May 2017, after the current La Liga season. Now the schedule foresees groundbreaking in March. These works would only include several sections outside the stadium. First, piping needs to be rerouted and staircases remodeled to free up space in each corner of the stadium. Then foundation laying for eight tall concrete columns will be laid. Each of these columns will eventually support the stadium’s new roof trusses. During the 2017/18 season capacity of the stadium will temporarily fall to 25,000 people, losing some 7,000 seats on the south end. Currently curved, the old stand will be demolished entirely and rebuilt in new form, moved up to 20 meters closer to the field. At the same time crucial work on the roof will go on. The 8 pillars outside will support four interconnected main trusses hovering over the entire stadium. These will be installed above Anoeta during this period. While work on the south stand will enter final stage, the La Liga season will end in May. This is when workers are to enter the field and relay it significantly lower than the current one. This will give room for additional rows of seating in front of the west and east stands. Not content with just adding a few rows, as it happened in Leganes, Real Sociedad will run complete reconstruction of the lower tier on both east and west sides. 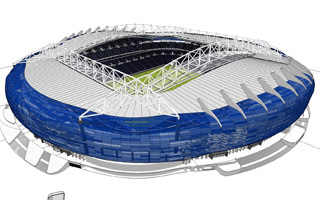 After the south stand is delivered, interim capacity for the 2018/19 season will reach pre-revamp level of 32,000. At the same time identical stand will be built along the north end, mirroring the south one. During another summer break further changes will be made to the east and west stands, this time outside. First the cascading staircases will be dismantled, leaving room for a limited expansion of floor space. Then, ending the whole project, new stairwells will be made and the entire façades covered with blue cladding, matching the ones on both reconstructed end zones. By that time Real Sociedad will spend over €50 million on the project and reach the goal capacity of 42,300 seats, all in time for the 2019/20 season.